One of the stunningly beautiful islands of the Caribbean, also called the ‘Pearl of the Antilles’, Haiti has been witness to a rich historic past. However, it was struck by an earthquake of catastrophic magnitude (7.0 on Richter scale) in January 2010 that destroyed its buildings and towns, displacing the people and their lives. Since then massive reconstruction efforts have been going on in Haiti in an attempt to rehouse its people and restore their lives and dignity. Vincent CallebautArchitects have proposed a utopian eco-village, inspired by the coral reef, to provide housing for 1,000 Haitian families as part of the reconstruction efforts. 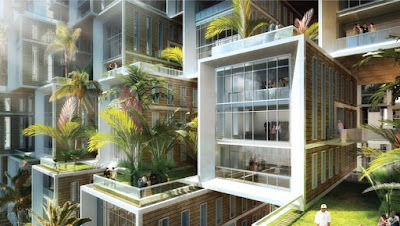 They have developed a plug-in matrix to build a self sustainable village from a standardized and prefabricated module. This basic module is a duplex of two passive houses, a metal structure with tropical wood facades interlocked around a transversal horizontal circulation linking every unit. 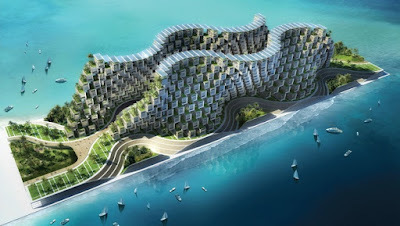 Built upon seismic piers off the coast of the mainland, the Coral Reef project comprises two rows of wave-like housing structures standing on an artificial pier. The modular housing units are layered and cantilevered in staggering rows on the façade of these structures. The roof of each module offers itself as an organic suspended garden for each Creole family to cultivate their own food. Between the two inhabited waves is a lush interior canyon with terraces and cascades of food gardens. This canyon – the central axis and heart of the community life of this eco-village – will be a true reflection of the Haitian tropical ecosystem with its distinct and diverse local flora and fauna. An anti-seismic basement, which will absorb the seismic shocks of an earthquake, will be provided in the heart of this canyon to provide a safety shell to its inhabitants in case of another natural calamity. This basement opens up to panoramic views of the ocean on the other side, and will be used as a multi-purpose community hub to enhance the social life of this futuristic village.